The Goddess Venus is jealous of the beautiful human girl Psyche and blames her pet unicorn, Unico, as Psyche's source of good luck. Venus has Unico banished, and it becomes his fate to forever journey from one place and time to the next, with the West Wind. Unico is a little unicorn which has the ability to make everybody happy. That's something the gods don't like of course. So they send out the west wind to bring Unico to a place where Unico never will be seen again. The west-wind however isn't able to as she likes Unico too much and brings him to a lonely island instead. From there, the adventures and travels of little Unico start. 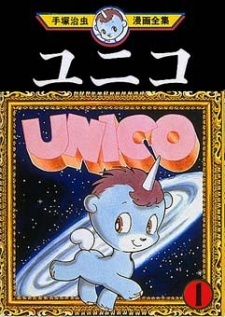 Unico was published in English as a single omnibus volume by Digital Manga Publishing on April 23, 2013. It has also been published in French as Unico, la petite licorne by Soleil. Over the years I have become somewhat numb to romance stories, and the more emotionally evocative or convoluted the plot twist, the less I seemed to enjoy the simple tale of love between two people. And here enters Unico, a story about an infant unicorn with magical powers that only work if she is loved. And I rate it an 8/10, so obviously something is wrong with me. Or maybe not. Because, yes, on the surface, Unico is a story for children who want some colourful adventure to immerse in. But as I read the story, it was clear to me that there is more than meets the eye, which did not surprise me seeming as this is Tezuka we’re talking about. The 2 volumes cover 8 different short stories as Unico travels on a flying spirit that leaves her in the company of a variety of different people and other furry animals. Each story conveys a different type of love, some of which are: young love, mature love, the love between friends, the love of family, the love of pets, and even forbidden love. The majority of these stories starts with two people meeting and ends with them falling in love. And with the two characters falling in love, without the need for Unico’s love, they discard her, leaving her to once again travel alone. And quite appropriately, one of the later stores delves a little into the isolation of not being loved by anyone at all. The charm this manga conveyed caught me by surprise, and the raw feelings shown through very obvious means (giant hearts in the sky for example) humbled me. Sure there were simple and cliché plot twists, and the “love” could be seen as mere lust or affection, but I like to think that Unico is somewhat of a cupid, bringing two people together in the name of love. Many questions are pondered by our little one-horned friend, such as what even is love? What does it mean to be alone? And does it really even matter either way as long as you’re happy? By no means do you have to take these as anything meaningful – which is why Unico is so family-friendly – but if you choose to, then the story can actually have some merit even for hardened adults. Just be aware that the cutesy film covering the story is not all this series has to offer. I will quickly end saying the art style is good old Tezuka, but with a twist. Because I am yet to mention that the entire series is in full colour. I need say no more. Overall, I give Unico an 8/10, as any lower would be a mockery and any higher would be an overstatement, as yes, there are inherently “better” stories written by Tezuka (namely MW and Ode to Kirihito). Osamu Tezuka is known in Japan as Manga no Kamisama, or the God of Manga, for a reason. He has written works in every genre, for every age, seemingly for every mood or situation one can find oneself in. I have personally read very little Tezuka that I was not instantly engrossed with. Unfortunately, Unico is one such book. Unico is a book intended for children. It is short and simple, full of moral lessons and a surprising amount of heartbreak. It is one of Tezuka’s more cartoony books, with plenty of small gags and a focus on the cutesy. It is not, in any way, a bad book, but it does not contain the charm and depth that is normally found in Tezuka’s work. Each of the nine chapters stands alone, and I often found myself bored with them. All the stories were quite cute, but they were also extremely repetitive and shallow. The biggest problem I had was not with the story, but the printing. Words were often somewhat buried into the center of the book, making me have to crack the spine much further than should have been necessary. The layout, though, is otherwise clever and very different from what one normally sees in any sort of graphic novel. This being said, I was also extremely disappointed in the end, or lack thereof, of the book. One more chapter would have closed the story up nicely, making a far more satisfying work. Unico is a tad boring and rather shallow. It is not a perfect representation of Tezuka’s genius. It is, however, a wonderful book for children or for someone looking for something a little lighter. A good introduction for younger audiences to Tezuka’s work. Unico is a fairy-tales-like shōjo manga from Osamu Tezuka. It was started in 1974 in the short-lived magazine called Ririka. Tezuka is known for crafting some of the first notable shōjo manga, with for examples Ribbon no Kishi in 1953 or the shōjo version of Hi no Tori in 1956. Those stories were for their time quite interesting ; definitely cute, stereotyped but with some little twists here and there, with cartoonish humor and compelling stories. But then, 20 years after, in 1974 Tezuka did a new shōjo again, Unico. Basically Unico is the same than those two manga, but without any humor, the little twists aren't there either, and there no real story anymore : you just repeat again and again the same motif because Unico forget everything between each chapter. That's the main issue of that manga : no story, and thus no real character. It was really a boring read. The other issue is simply that between Ribbon no Kishi and Unico, the content didn't really evolved, yet there is 20 years of difference between the two works. During those 20 years, there was some authors like Hideko Mizuno, Moto Hagio, Yumiko Ooshima and others who really changed the face of the shōjo manga, with more deep and complex stories and characters. Tezuka said it himself in the postface of Unico : Unico is anachronistic, by being too smooth, too cute for being cute and with too flat, one-dimensional characters. You can't compare Unico to, for example, Wata no Kuni Hoshi from Ooshima, another manga for young girls from the same period than Unico. Tezuka is known for being a precursor, but with Unico, he was really has-been. Is Unico a bad read? No. But if you are planing to read some old shōjo from Tezuka, you might as well read Ribbon no Kishi or even Hi no Tori that are more interesting in my eyes, more compelling. And anyway, Unico was published 10-15 years too late.